Stoke Youth Network’s Leslie Hogg sees talented local youth on a regular basis. Hogg quickly recruited esteemed local photographers Zoya Lynch and Bruno Long to judge the contest, various prizes and the Revelstoke Current is thrilled to be publishing the winning images. “Bruno and Zoya were eager to team up and be judges for the contest. They are great role models for turning your passion into a career. I hope resonates with the youth who enter,” says Hogg. Long was also quick to agree to judge. “Helping youth discover their artistic side is an important aspect for me as a photographer. I had very little in the way of a mentor when I began taking photos. Throughout the years, I’ve now had many mentors who have helped inspire and shape my own career and photographic style. Repaying that debt is very important to me,” he says. Both judges anticipate seeing creativity and fresh perspectives through the lens of youth that might surprise the adults viewing the images. That perspective will likely show a different side of Revelstoke. Long also would like to see images that are not an attempt to replicate the adventure industry. A wide range of photos have already been submitted, and that is what Hogg is most excited to see. “There is everything from beautiful portraits to action shots to some amazing landscapes,” she says. “The competition is going to be a tough to judge because the caliber of photos that I’ve seen so far is super impressive,” Lynch agrees. The competition is a chance for these established photographers to connect with youth photographers in town, and it is something Lynch and Long are both hoping for. “Revelstoke is well on its way to having a large photography community and it really excites me. Plus I am keeping my eyes open for an intern,” says Lynch. “Helping youth realize that there are other creatives out there willing to help them is something I hope they take away from this experience,” says Long. 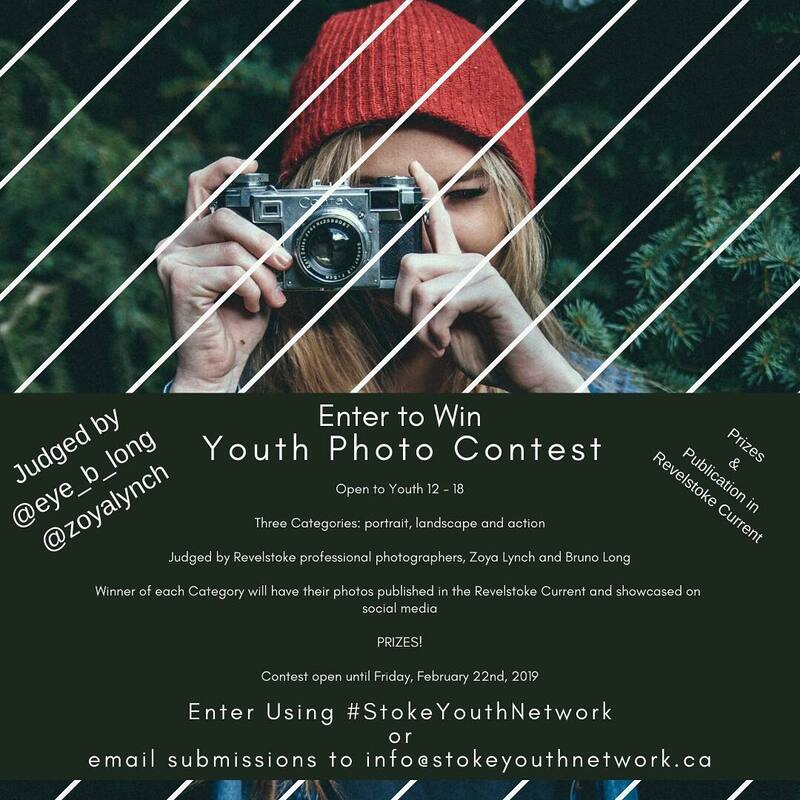 Youth can enter the competition until February 22 2019 by tagging #StokeYouthNetwork or emailing photos to info@stokeyouthnetwork.ca. The competition is open to youth 12-18 years old. Prizes will be awarded in the following categories; portrait, landscape and action.